When Nyaka Primary School was still a small, two-classroom school, our teachers noticed that their students were unable to stay awake during class. They saw that many children suffered from stunted growth and had bloated bellies from malnutrition. When Nyaka staff visited their students’ homes, they realized that their grandmothers could not afford enough good food to keep them fed. We realized that, if we were going to see our students succeed tomorrow, we had to make sure they were fed today. 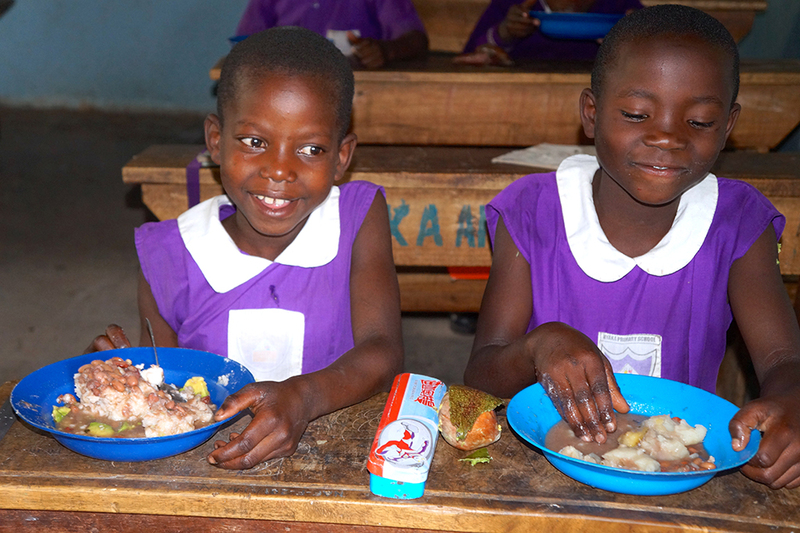 Nyaka provides a school meal program that has enabled the students to enjoy school and perform well. Free meals encourage guardians to send their children to school. For some of the students who live in extreme poverty, these are the only meals they get in a day. Many students suffered from chronic malnourishment prior to receiving meals at Nyaka and Kutamba. The students’ weight and height is regularly monitored to ensure they are receiving the appropriate number of calories to fuel their growing bodies. The children get breakfast every morning and they love their food. Breakfast usually consists of mil or porridge and a roll. Thanks to a generous gift of 200 chickens, we now have eggs to feed the children once a week. At lunch, the students are given another healthy meal that usually consists of beans, meat or another type of protein, posho (finely ground white corn flour mixed with boiling water until it becomes solid), or corn mash, rice, Matooke (a banana paste), and sweet potatoes or Irish potatoes. Nyaka students have meat once a week, typically a treat that is eaten only once a year at home. Students work with their guardians at Desire Farm and are able to take produce home. This program also includes free distribution of vegetable seeds provided by Seed and Light Inc.
To learn more about Desire Farm and how it helps to feed families, click here.